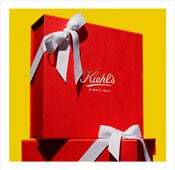 Since 1851, Kiehl’s has cherished its tradition of gifting and personalized service inspired by our rich history and flagship store in New York City’s East Village. We offer a distinctly unique and convenient way to express your appreciation for clients and colleagues for any holiday or gift giving occasion with a wide selection of efficacious skin, men and hair care products, made from the finest natural ingredients. Each gift is packaged in our exclusive travel bags and elegant gift boxes creating a truly memorable present.